Emily Paull- Writer | Fiction Reviews & Creative Writing : Monthly Catch-Up: 3 October Mini-Reviews! Monthly Catch-Up: 3 October Mini-Reviews! I've been a little tardy with my book reviewing this month, and a backlog has begun to accumulate on my desk of books waiting to be written up. So in the spirit of clearing the desk, I thought I would post them all at once, and do a monthly-catch up! I managed to read seven books this month, which isn't actually a lot for me, but one of those books was Dragonfly in Amber, which is about 1000 pages long so naturally it took a little longer than usual. These three books I have for review today were all read in the last week of October, and read quite quickly, and oddly enough all have red spines. What a coincidence! A Place for Us is published by Headline books, an imprint of the Hachette book group. It's about the Winter family, who own quite a large, memorable house in a small English town. The house is known as Winterfold, which kept making me think of Game of Thrones (There will always be a Stark in Winterfell!). It begins when Martha, the mother of the family invites all her extended family back home for her 80th birthday celebration and hints on the invite that there will be a big announcement. No one is able to resist the call of this secret and they all gather at the house to hear what it is. No one, except the Winter's wayward oldest daughter Daisy. Jumping into reading this book straight after Us by David Nicholls, I couldn't help but think that this book did the English family drama in a slightly more kitsch fashion that I am usually drawn to. The drama of the big announcement kept me reading on, and I have to give Harriet Evans points for her original secret, because it was certainly not what I expected at all, but overall the book was somewhat twee. The best bits were those about the other daughter, Florence, who was really unconventional, and you could see that to an outsider, quite unlikeable also. She had a kind of obsession with her coworker, Peter, and as a result was embroiled in a nasty court proceeding with him, and these bits for me had depth and were very new and fresh. I also pictured Colin Firth in the role of Peter were this made into a movie. Bit of a change of pace here, but I thought I would celebrate Flanagan's recent Man Booker prize win by reading some of his older work. I read Narrow Road to the Deep North late last year and loved it, but I do find that Flanagan's relationship with language does take some getting used to. He writes in a very pared back, poetic style which can sometimes be deliberately obscure, and I find that it takes me about 40 pages to get used to it. Then, once I am in it, I can finally understand the nuances of what he is saying, and more importantly, what he is not saying. The Sound of One Hand Clapping is about Sonia Buloh and her father Bojan, refugees from Europe whose lives are shaped by the loss of Maria Buloh, Sonia's mother, when she is three. Bojan is very flawed as a father figure, but Sonia always sees the great potential in their relationhip, and his failure to live up to her expectations sees them separated for most of Sonia's life. But in her thirties, she returns to Tasmania, pregnant and looking for answers, and she and Bojan both re-traverse the paths that led them to their misfortunes. Flanagan is a beautiful writer, and sometimes the things he says stop me cold with the truth of them. I also learned recently that he was involved in writing the script of the film Australia, but we'll have to forgive him for that. This was a very interesting book about a girl named Rose, who makes for a likeable, compelling and ultimately unreliable narrator. (I'm obsessed with those at the moment.) 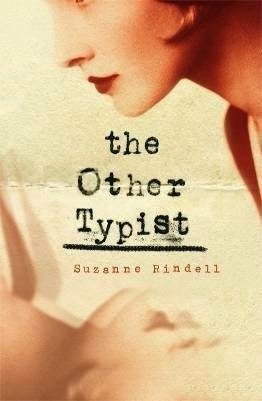 She is a typist at a police precinct during prohibition, an orphan and a goody two shoes with no charm and no fashion sense, but she's a very proficient typist. When Odalie is hired to work at the same station, Rose is both drawn to and horrified by her manipulative charm and rich, flashy style, and she both judges her and longs for her attention, keeping a journal of Odalie's movements. Rose and Odalie become friends, and Rose is soon invited to live with Odalie. She is taken into a world of speakeasies and bathtub gin, and begins to learn a little more about Odalie's past. The narrative style of this novel can sometimes be a little stilted, as it is revealed Rose is telling this story at the behest of her doctor, and she keeps getting ahead of herself and then stopping, and stressing she needs to tell the story chronologically. I think this was intended to build tension but what it actually does sometimes is jar the reader out of the flow of the story. I was struck by the similarity of this novel to The Great Gatsby, at least plot wise, and others on Goodreads appear to agree with me, but to be honest, I was thoroughly taken in by this novel and I think it bears rereading, if only just for its sumptuous descriptions and sense of atmosphere. Okay, so that's me caught up for the month. What did you read this month? Have you read any of these?